I love popcorn! It’s the one food I really can’t resist. The one food I’ll eat even if I’m already full. Strange but true. I even like horrible movie popcorn, and microwave popcorn, and popcorn out of a bag with strange cheese-flavored powder on it. How do you like your popcorn? Do you like it salty? Sweet? Salty and sweet? Coated in sticky caramel and packed in a box with a toy in it? When I was in college we doused it with goyo adobo seasoning. I’ve put curry powder or other spice mixes right into the oil as it cooked, infusing every bite with flavor. But I like it best popped in olive oil on top of the stove, and generously sprinkled with sea salt and a shake of freshly ground pepper. If, like my husband, you consider it packing material, you can still revel in the fact that popcorn is the inspiration for some of the best songs ever! 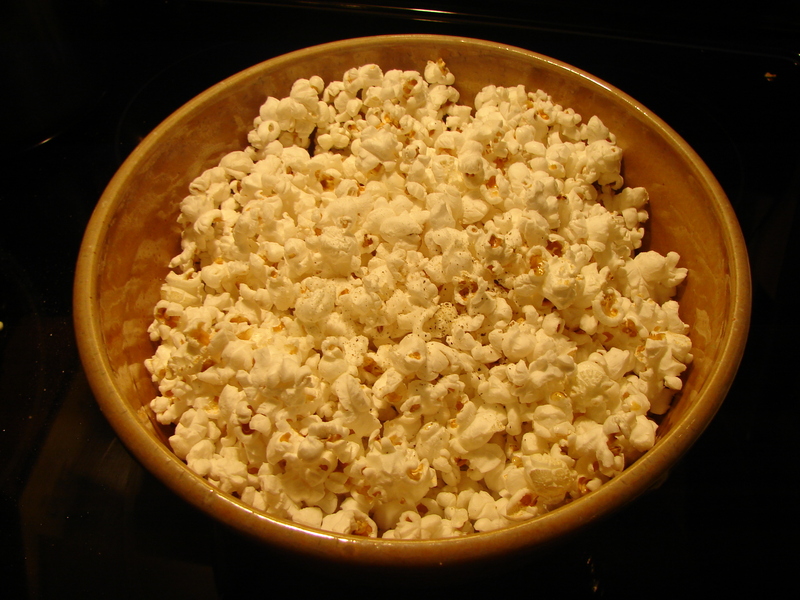 Here’s a playlist to get you shaking your … popcorn pot! Over high heat, warm enough olive oil to generously coat the bottom of a largish pot. (I never measure, but I believe 1/3 cup of kernels to 3 T. oil is standard). Add 4 kernels to the oil and cover the pot. When all four kernels have popped, add enough popcorn to cover the bottom of the pot. One layer is ideal, two layers will work, too, but you’ve got to shake it, baby! Holding the cover on tightly, give the pot a big shake, so that every kernel is coated with oil. Then let it pop! I like to leave the lid slightly ajar, so that the steam escapes, but try to point it away from you because hot popped corn will come shooting out at you from time to time! Keep popping and shaking the pot like a polaroid picture until the furious popping slows down. When it has nearly stopped popping, take it off the heat, pour it into a bowl, and season as you like it.